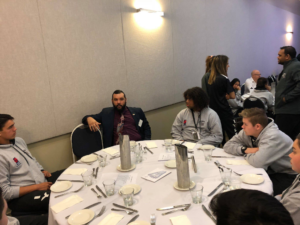 IAA Relationship Manager Matt Lancaster recently had the opportunity to attend the Indigenous Youth Leadership Program (IYLP) gathering held at the Novotel in Olympic Park, Sydney, on 7 September. The event, called “Straight Talk” was an opportunity to participate in speed mentoring, and gave Matt the chance to share his story and talk about the value of a career in accounting to an audience of 45 Indigenous Year 9 and 10 students from around the country. The mentoring program, created by the Smith Family, is a government funded program aimed at closing the gaps in Indigenous educational disadvantage by creating greater access to additional education choices for Aboriginal & Torres Strait Islander students – particularly those from remote and very remote areas of the country. “The students were a little shy at first however it didn’t take them very long to jump out of their shells and start asking questions. I had the best day hanging out with these young men and women, laughing and sharing stories” said our RM.